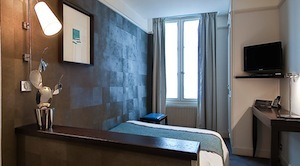 The Hotel Duo is located in the heart of Paris’ historical district of the Marais. Essential places such as the Centre Pompidou, the Louvre Museum and Notre Dame are located only a few minute-walk from the hotel. The bedrooms are modern, warm and feature many services such as free wifi, air conditioning, room service, a sauna, a gym, a lounge bar, a luggage room and a 24 hours a day réception. Parking: You can benefit from discounted rates in the car parks on this page by reserving your parking space via parkingsdeparis.com.